There are so many mixed messages about recycling plastics. There are articles like THIS that say that #6 plastic is easy to recycle and is accepted everywhere. Then there are articles like THIS (which match a little more with my understanding of the recycling process in my area) that say that some plastics, like #6, are very difficult to recycle so unless you take it to a drop off location, it's likely to be sent to a landfill. As a consumer concerned about the environment, I find it very confusing. In my recycling research, I did find out that #6 plastic containers (like this one that my sister got from a local sandwich shop) are a crafty gal's dream come true... We can recycle them at home, and make homemade shrinky dinks! Yep, this plastic is the shrinky kind! I cut the top and the bottom out of the container, so that I could use it with my 2" round craft punch. Don't worry, I cut out and saved the ridged, rounded sides for Mims to use (we use the whole buffalo around these parts). 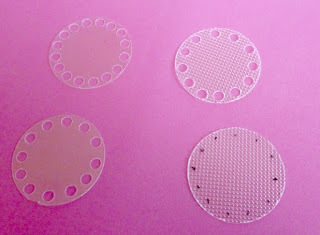 Once I punched out the 2" circles from the plastic, I used my regular sized hole punch to make holes around the outer edge of the circle. 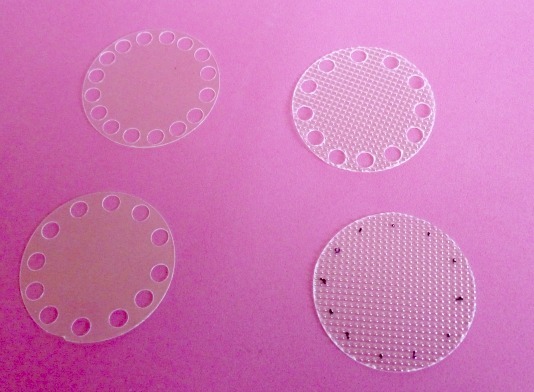 Once I got one punched exactly the way I liked it, I used it as a template to mark the un-punched circles. I am a fan of TJ Miller. 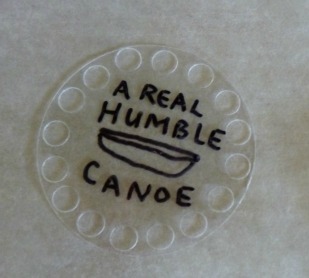 He's got a stand up bit where he talks about how upset he is that sportscasters call players who show off too much 'showboats', but never call the more modest players 'regular boats', as in "He's a real humble canoe." It made me laugh so hard I almost couldn't breathe. It still makes me laugh every time I think about it. 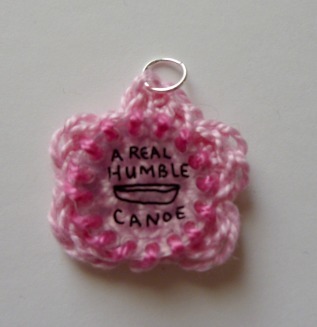 So I wanted a humble canoe bracelet. 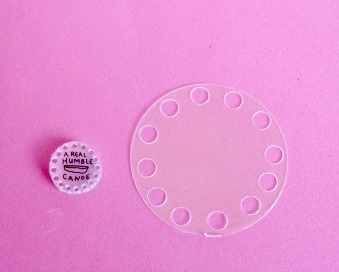 My 2" circle shrunk down to the size of a dime. 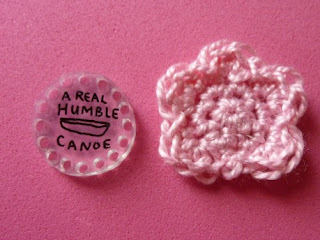 The holes I punched were too small to crochet through. I made a little flower to sew my shrunken disk onto so that I could turn it into a charm bracelet! Use contrasting color cord, sew shrunken plastic charm to center of flower. Attach jump ring through a stitch in the top petal. Attach jump ring to bracelet (I attached mine near the clasp). You're done! Put it on and admire your awesome handiwork. But don't dance around TOO much, you showboat! 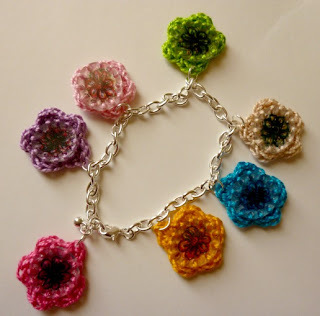 I used this exact same technique to make a flower bracelet too! I drew flowers with brightly colored permanent markers on 7 plastic circles and shrunk them down in the oven. 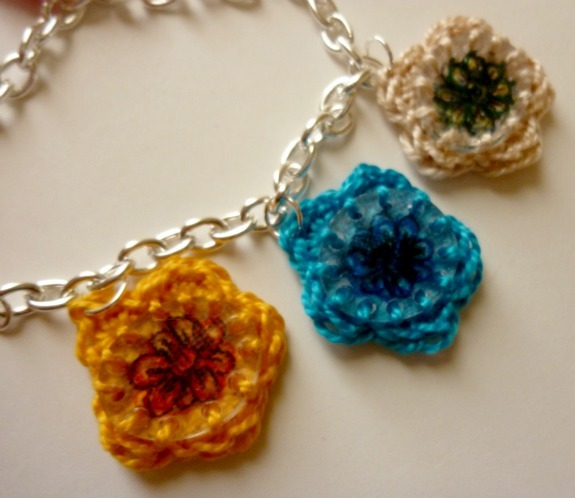 I stitched them on to crocheted flowers using craft cord that matched the color of the flower. I love how this one turned out too! It looks like cheerful springtime to me. In this cold gray weather we've been having, a nice bright bouquet on my wrist sounds really good. Especially since it's keeping plastic out of our landfills!! For more recycling projects, check out the January 2013 projects from my Free Crochet Patterns page. OMG, I was just thinking about shrinky dinks today. Great project, another on my to do list. Also, I wish I still had a girl scout troop. This would be a great project. I love Shrinky Dinks and recycling. This is a great tutorial. Hi Pam! Thanks!! It was really fun to make! Would love to do this! 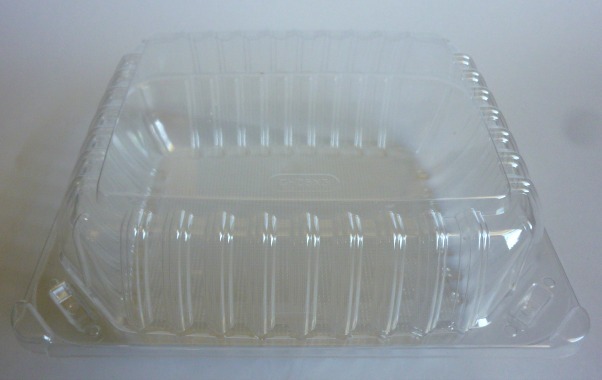 I just have one question; how can you tell if a container is #6 plastic or not? Thanks! Can't wait to try making some of these! Now I must see if I can't find some #6 plastics! This would be so fun! I bet I could even coax my hubby into decorating/crafting! This project was surprisingly fun for my family! We're still making new projects with it. From what I've browsed this can be added of a Downcycling machine, because it are combining differing types of plastic to conceive one thing inferior. If you do not hold the diverse styles of plastic distinct. 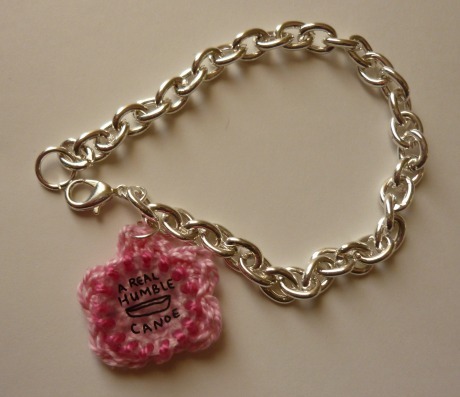 this is an amazing idea, just read something involving the shrinky dinks.which are not available anywhere around here. but you solved that problem. and i love the recycling aspect to this. can't wait to get started...thanks for sharing. I just stumbled upon this post and I absolutely love this idea! I am already thinking of other things to make with #6 plastic! I for one did not ever get to enjoy shrinky dinks, but I did see them when raising my boys, never bought them. Thank you for sharing this idea. You are totally my hero for giving this back to me.